Ufuk Kocabaş spent his summers swimming, snorkeling and eventually diving around nearby Marmara Island, where his grandfather and other forebears plied the sea as sailors. At age 14, he stumbled upon his first shipwreck, littered with pieces of amphora — an ancient type of storage and transport container — and got an early lesson in proper archaeological practice. Last summer, I had the privilege to peek into Istanbul's far-distant past with Kocabaş, who helped lead the archaeological excavation that uncovered perhaps the world’s largest collection of Byzantine shipwrecks, and evidence that the city's history dates back nearly 6,000 years farther than previously believed. My story about the work of Kocabaş' Yenikapı Shipwrecks Project, and other fascinating urban archaeological digs from Rio to Rome, was published as the September 2015 cover story of Discover, my first piece for the renowned science magazine. 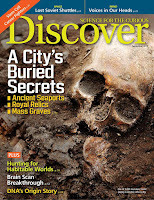 Read my article, "Underground Transit Projects Reveal Secrets Buried Beneath Cities," in Discover.